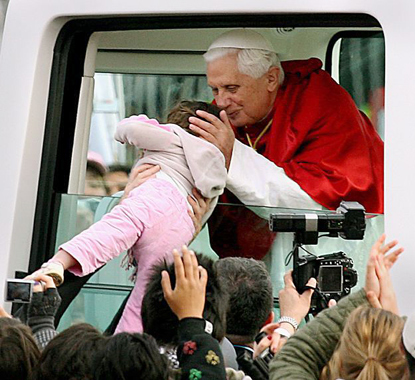 A three-year-old girl blessed by the Pope survived being crushed under the wheels of her father's 22-seater bus in New South Wales and her father thinks a Guardian Angel saved her. Peter Hill thought he had killed his daughter Claire earlier this year when the four-tonne vehicle rolled on top of her as he queued for petrol on Tuesday. But this morning she was ready to be sent home from hospital with little more than grazes and minor bruising. Pope Benedict XVI kissed Claire at Randwick in Sydney during a state visit in July 2008. Her father said: "I couldn't think anything other than a guardian angel was holding that bus up and keeping the weight off her." His wife Sue, a mother-of-11, said she had placed a Catholic symbol around her daughter's neck an hour before the accident.